This protocol focuses on multifamily buildings (multifamily is typically defined as residential structures with five or more units, a typical threshold used within the housing industry for multifamily rental properties). The protocol is intended for Targeted Projects, including single or multiple measure projects costing typically under $200,000 and therefore engineering requirements must be scaled to fit performance risk. 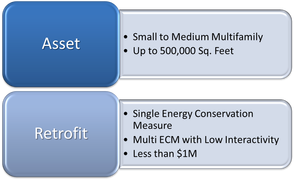 The EPP - Targeted Multifamily allows for the use of various open-book calculation methods, and relies on partial and full measurement and verification of the energy use and system(s) to which an energy conservation measure (ECM) was applied (Option A: Retrofit Isolation: Key Parameter Measurement and Option B: Retrofit Isolation: All Parameter Measurement). However, these approaches may not be appropriate for buildings requiring a more holistic approach, that may require the use of an energy model to determine energy savings, as well as an Option C: Whole Facility approach for measurement and verification of savings. In the case of a building requiring such a holistic approach, the M&V protocols found in the EPP-Targeted Multifamily Protocol should be used for these specific components of project development, or in its entirety. The Energy Performance Protocols are intended as base minimum requirements for an investment quality analysis and best practices to maintain, measure and verify the energy savings, not an exhaustive treatment of all possible techniques. Each section of the document establishes these minimum requirements and offers additional methods and tools that can be used to improve the reliability of savings estimation and measurement. Until the protocols have been applied and tested sufficient performance data exist for projects following the ICP Protocols, it is not possible to gauge the magnitude of the impact of these additional processes and tools on the confidence interval around savings projection. A checklist provided as part of this document is intended for inclusion in project documents. Providers are asked to self-certify that they have fulfilled the requirements listed and to indicate what additional methods they applied. This document will evolve over time. Some methods may move from an “additional” or “recommended” category to a standard requirement. Others may prove insignificant for accuracy of projections relative to the time and effort they require. A scoring system may also be introduced to weight the importance of different components and provide an overall investment confidence score for potential energy efficiency projects. Members of the ICP invite engineers, building owners, software developers, prospective lenders and investors, and others to participate in testing and improving these protocols by applying them to retrofit projects and sharing their results.